Please post here. We're getting current stuff appearing in 2012 & 2013 threads, which will make it hard for people to find what they're looking for. Anyone know what's happening with the automatic cams? They haven't updated since Monday/Tuesday. I phoned them on Saturday morning. They said they are having trouble uploading the images but are working on it. Unfortunately, this seems to happen every year. They use a local ISP, really nice people, but I think they need to look further afield. Looks as though there is something happening up there this afternoon. Natural, not machine made. Here comes winter. Ungroomed at this stage, hopefully it will be groomed for the weekend. It was cold and windy today, but everyone who went up had a good time. It wasn't very crowded either. Toboggan run is great. Ski trails are well covered, but no grooming yet, making it hard going through the soft snow, especially where it hasn't yet been compacted by other skiers. More snow is forecast for tomorrow (Sunday) too. Spent today at Lake Mountain. Snowzilla 2.0 has delivered. On the way up there were dustings of snow about 1 km before the turnoff. Fitted chains at the ticket booth. 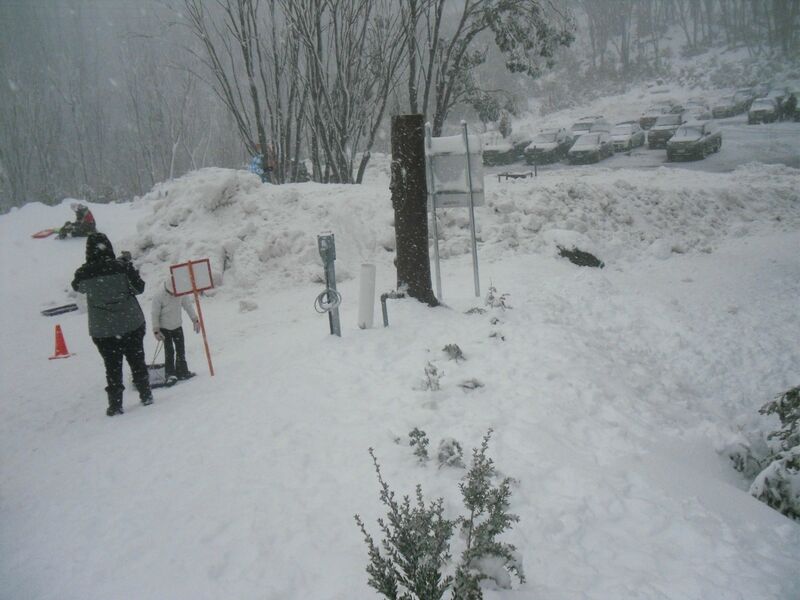 Snowline proper was about 1- 2km past the ticket booth. Road was very icy and slippery and chains were definitely needed. Got to the top carpark at 9:20 am. Headed out on the skis for 3 hours taking photos along the way. Went up to echo flat, along Echo Flat Trail through The Camp to the The Gap. 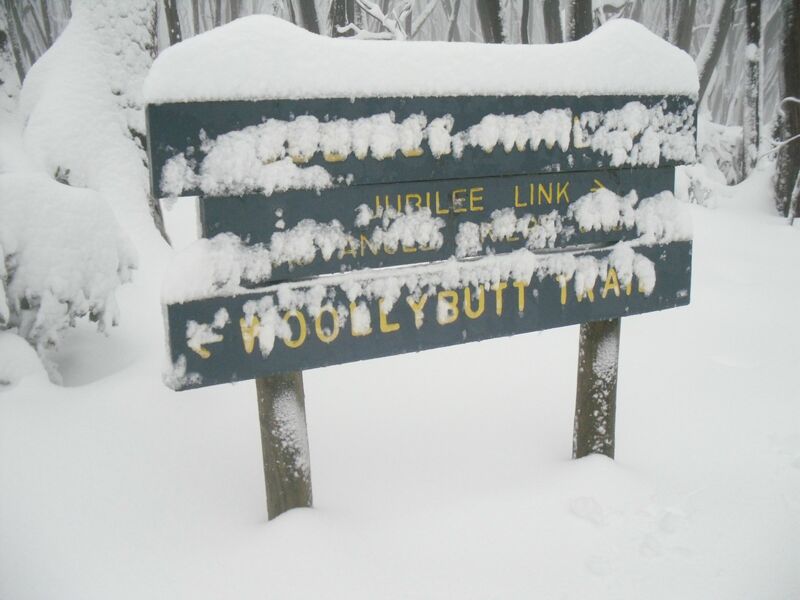 Went up a little way up Woolybutt trail but it was ungroomed. Returned via Muster Trail and the return trail. 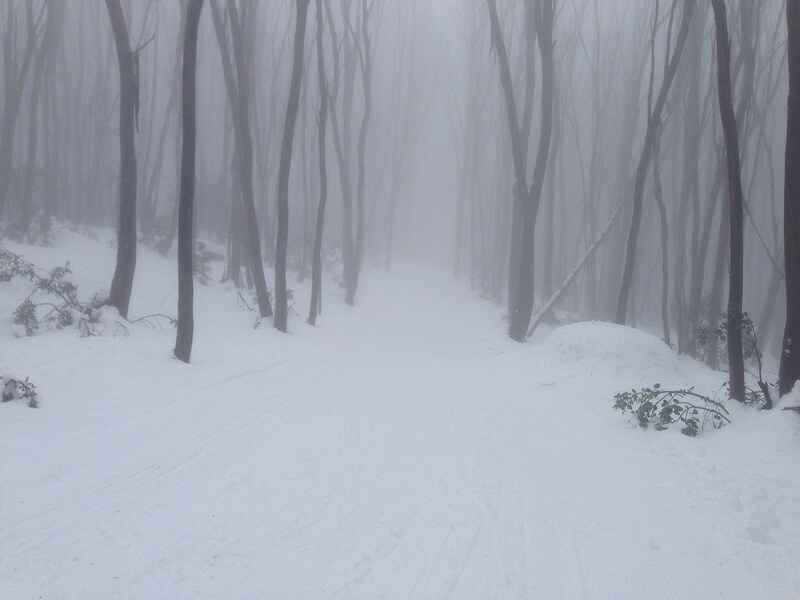 Coverage is continuous, fresh and nice to ski on (although ungroomed in sections) along the lower trails and even better on the upper trails. The grooming machines were out and about getting it all in order. Most of the main trails should have been groomed by now. Snowed consistently from about 10:30 am onwards... heavy at times. Nice big dry flakes occasional strong wind gusts but mostly light to moderate wind. Decent accumulation on the car when I got back. Left the mountain at 12:45 pm... snowing heavily. Lots of snow and ice on the road, snow clearing machinery running up and down as well. Lake Mountain is in the best shape for the June School holidays in years... well worth a visit at the moment. Will post some pictures shortly. TeleXC and dr80 like this. Equus and TeleXC like this. We postponed till today so we would have more fresh stuff. Lots of snow! Did a couple loops on panorama and our tracks had been filled in by the time we went around again! 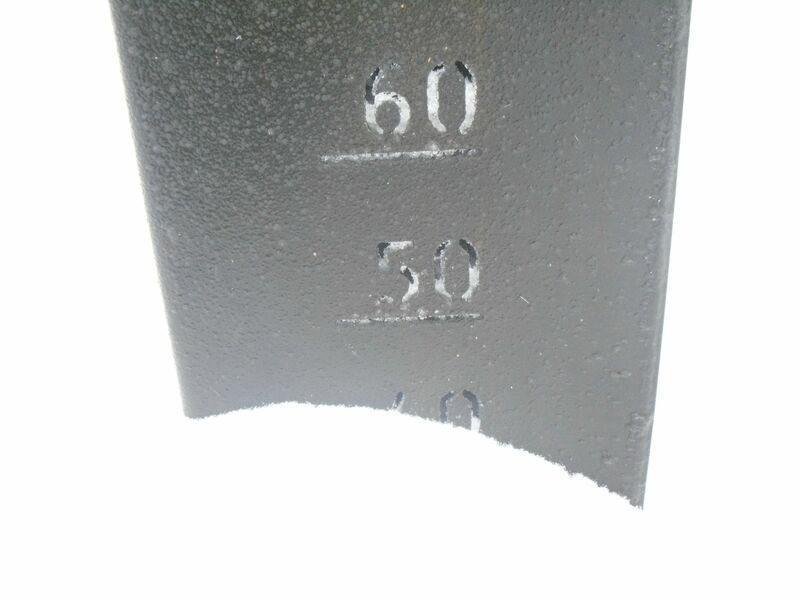 15cm on my car at the end of the day (2pm). Even had to put chains on to get me out of the car park (in an AWD) - wheels were just spinning! Should be some snowmaking tonight too since there's a forecast for frost. I'm planning on heading up tomorrow. Tecks, would you be willing to hire out your classical Ultrasonics tomorrow? I wouldn't mind trying them out. Can an all-resort season pass be purchased at the Lake Mountain ticket booth? It's mentioned on their website and they now have EFTPOS at the booth so I can't see why they wouldn't. I'll try them on in the shop, hopefully they'll fit. If not I'll just have to use standards. I plan to be there bang on 7:30. Hardly anyone returned their gear until after 3pm today. Even those who hired their gear at 7:30am. Even though it was snowing and very cold, without exception everyone raved about the conditions - skiers and snow players alike. See you then! I better make sure I don't sleep in! Snow making (using fan guns) overnight. See you next weekend I'll be bringing my cross country virgin skiing partner up to hire some stuff off you ! I don't have time to write up my usual full trip report unfortunately, so I'll just do a quick summary with some pics. The Ultrasonics were great thanks Tecks. Didn't know there was a ski.com.au discount, nice surprise. The snow conditions were excellent. A unusually deep base from last week with fresh surface from overnight snow showers. The fans guns were still running when we hit the trails at around 9am. The main Gerratys car park was full with the smaller one off to the side about half full. Chains for 2WD were required. I have to praise the staff efforts. The toll booth attendants gave detailed info re the road conditions (we were the first car of the day), the parking guys were switched on, guests services came round to our cars just after we pulled in to say hi and offer guidance for newbies, or in our case trail and grooming updates. The cafe staff were friendly and clearly happy to be there. There was just this general buzz around the place. There was snow only 4KM (!) out of marysville and cover shortly after, still well before the turn off. 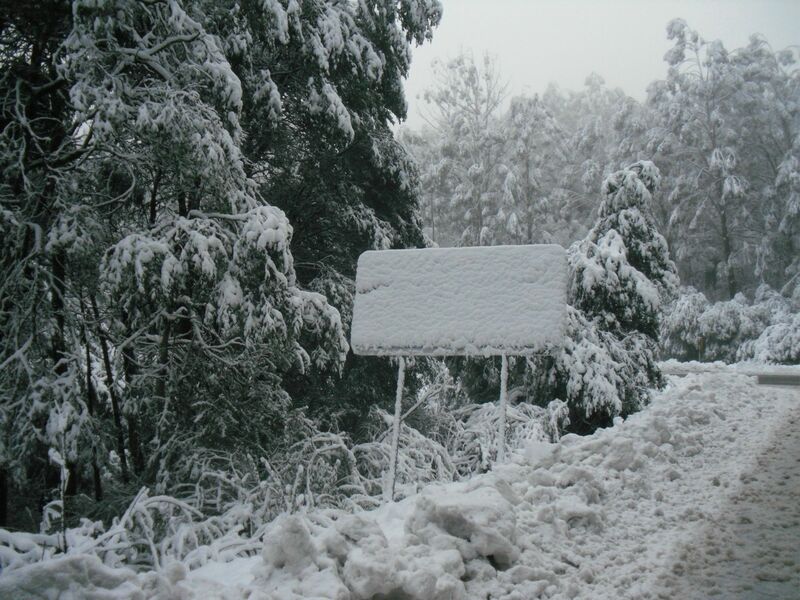 Ironically, I think this was the "Beware of ice on road sign"
Snow depth at Echo Flat. We didn't see the sun all day. Kept the surface nice though. No shortage of the white stuff. Wasn't much to look at at the lookout. The trail to Boundary Hut. It looks like they've done some maintenance work on it since last year, the track is wider/less overgrown and the orange arrows have been replaced with brighter fluorescent ones. In non-groomed areas it was pretty powdery. 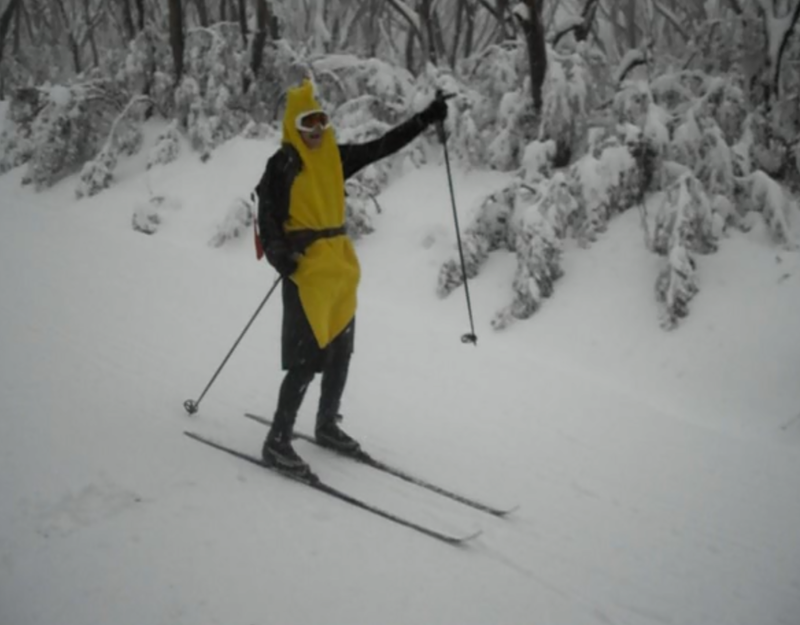 My brother felt the need to ski down Royston in a banana suit. They used a grader to clear the car park. First time I've ever seen it. Strangely though they chose to dump it at the bottom of the main toboggan run. 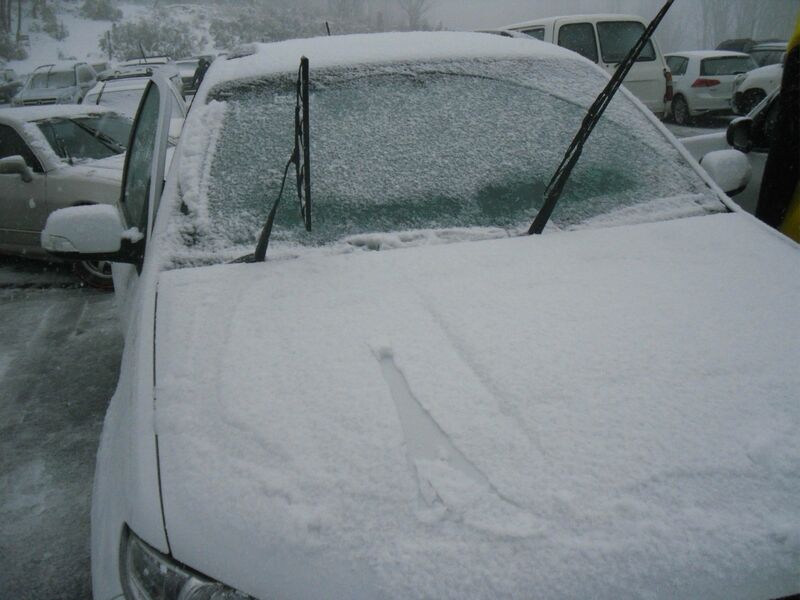 It was snowing significantly from 2pm until after we left at 2:45. The freezing level was still below the village. Equus, Claude Cat and teckel like this. The pics are fabulous, Carrotdude. Love the pic of your brother! Great shots and excellent conditions, by the look. Timing, too. I'll be up during the week. Not sure what's meant by "reported as commercial post", or who would make that report? It wasn't intended to be one. Now that's out of the way, great set of photos carrotdude. Tells a much better, more personal story than the snowcams can. MisterMxyzptlk and Cookie Muffta like this. 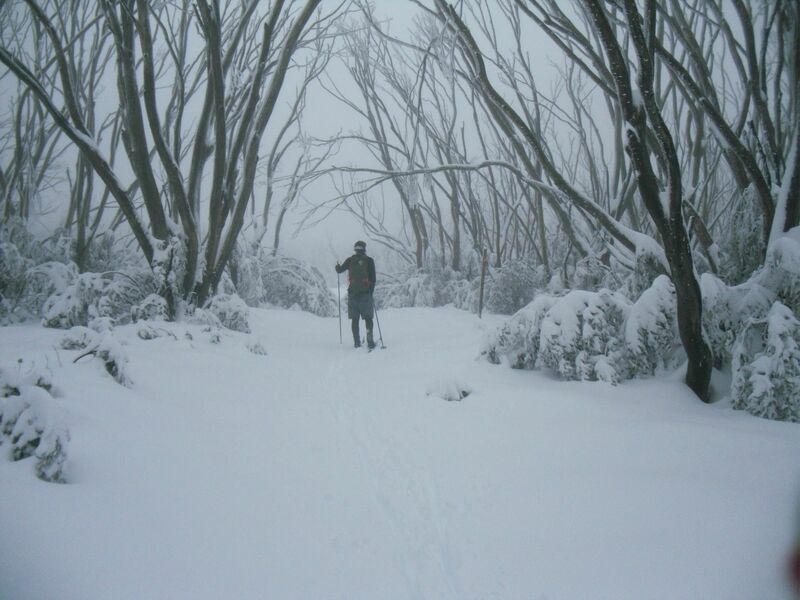 looks like this might be the year to check out small cross country resorts like LM & Mt Stirling. Yes, ladycamper. It's the best it's been in years, especially for this time of year. Again, some really nice pics. Hopefully that drizzle was not too much, but enough to compact the soft snow to form a solid base for what (we hope) is to come. 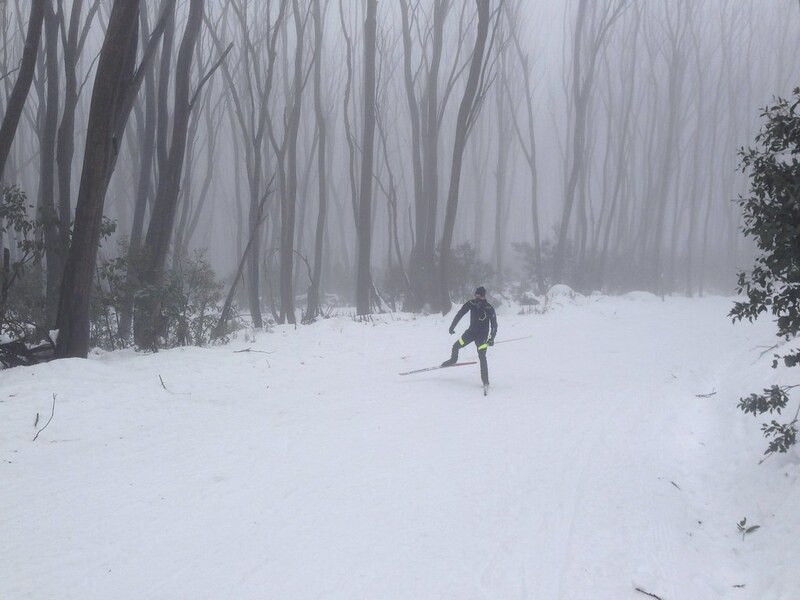 Skate-skied out to Panorama Lookout then back down Royston Rd for my first ski in nearly 5 years. Physically I was a wreck. That aside, it was a great experience. Most of the time, the only sound I could here when I held my breath, was the thumping of my own heart. The snow was a little variable ranging from just a bit crusty in sheltered shady places to quite sticky in the sun. Yes, the sun broke out for an hour, seemingly because it wanted to accompany on my circuit. 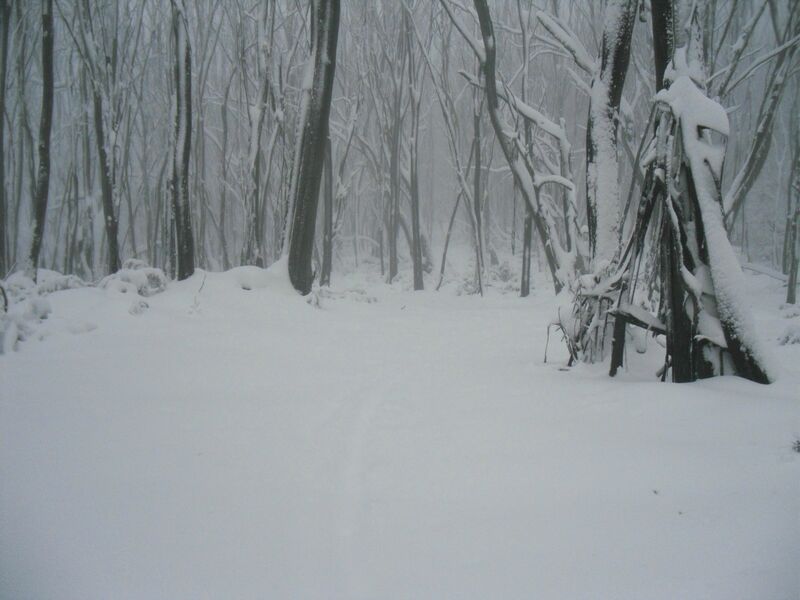 There were a few people on the trails, but considering that it's school holidays, good weather and great conditions, one would have expected more. Clearly it's not the $53 resort entry as the toboggan slopes were teeming with people. Bears say time to put snow guns away.....Team Bears were talking about BLIZZAARD and what do u think happened..
Great conditions at LM yesterday, with blue sky and sunshine. Good cover all trails but thinner down low. 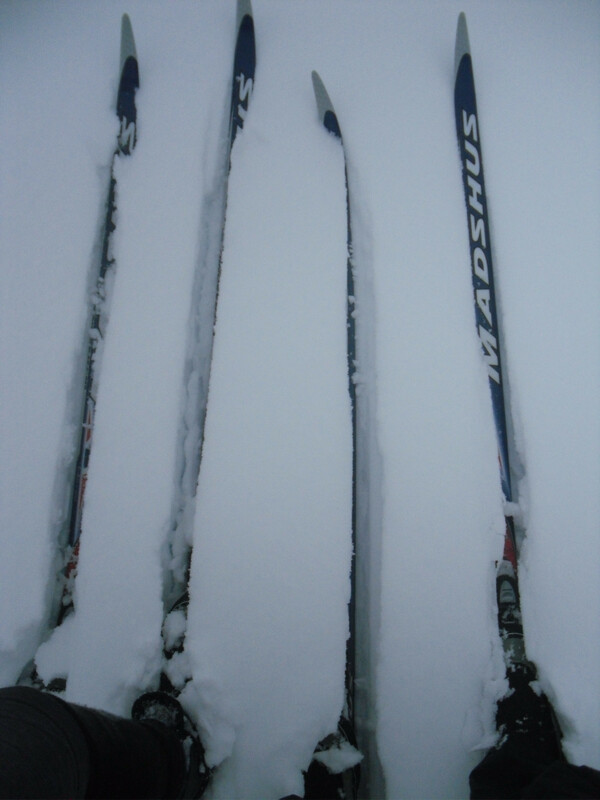 Took skates out in the morning on firm, fast snowpack. 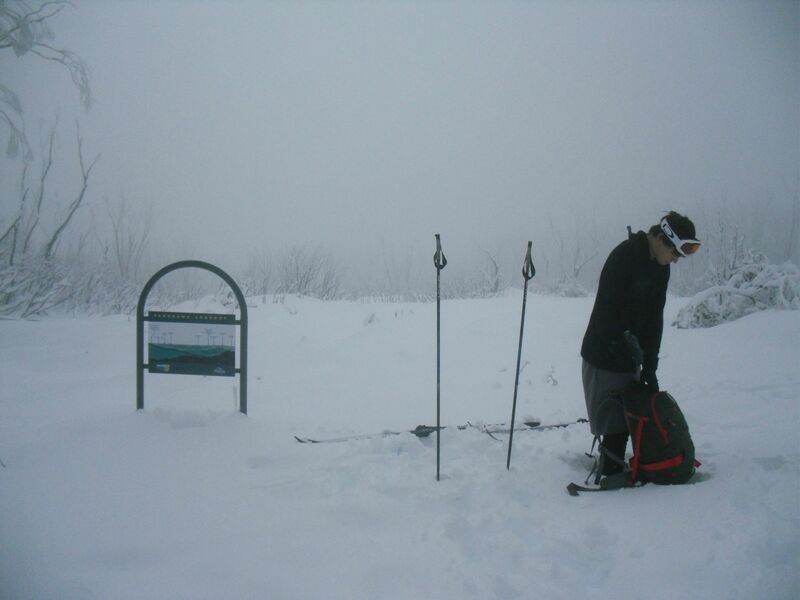 Softened up after lunch, so I took my fat skis and new boots up the return trail and part of Muster a few times. Easier climbing with the patterned bases, easier turns in T2s, but it's still a narrow trail, need to do some work on a wider, slightly steeper slope. Great to get in 2 consecutive days (well, one afternoon and a day at LM). Will be busy up there this w/e but I suspect conditions may not be so kind. First time to Lake Mountain with the family (5 of us) and we had an awesome time. The sun was out until 1pm and the snow cover was great. The toboggan runs we're well groomed and this being the kids first time to see snow, there already asking to go back. (- deleted by admin, reads like an ad for a shop trying to get free promotion -). We will be back for another visit soon, maybe as early as September school holidays, money permitting. Anyway, I was on my way down from the car park by 11:30. Hordes were streaming up on foot. The queue for the ticket booth was all the way back to the corner. Fortunately, the traffic was bearable on the way home. CrossCountrySkiHire, TeleXC and Canbat like this. Chains are required to be carried for all 2WD vehicles today (Wednesday). Drop in on the left in Narbethong and we'll size up your tyre for you, as well as giving you a demo of how to fit them. Equus and Stratus like this. 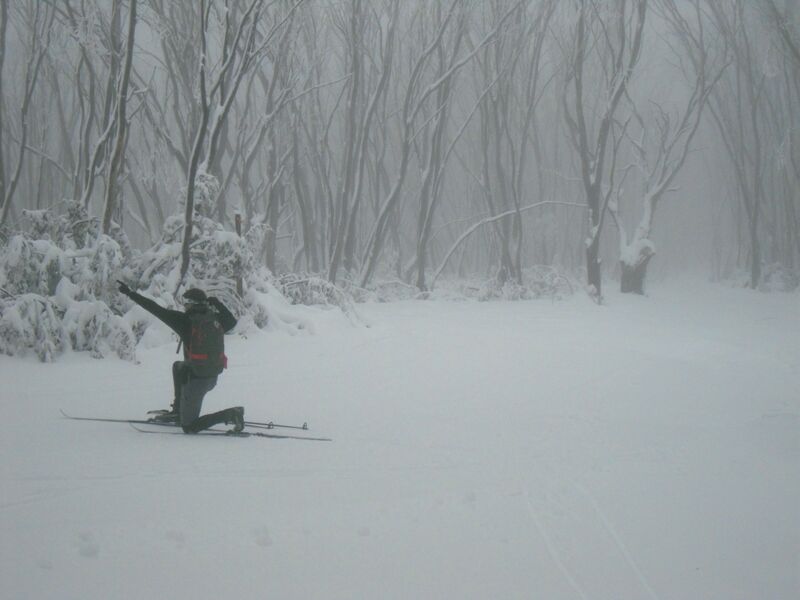 Lake Mountain are reporting 25cm fresh, 50cm at the village and 60cm snow making! 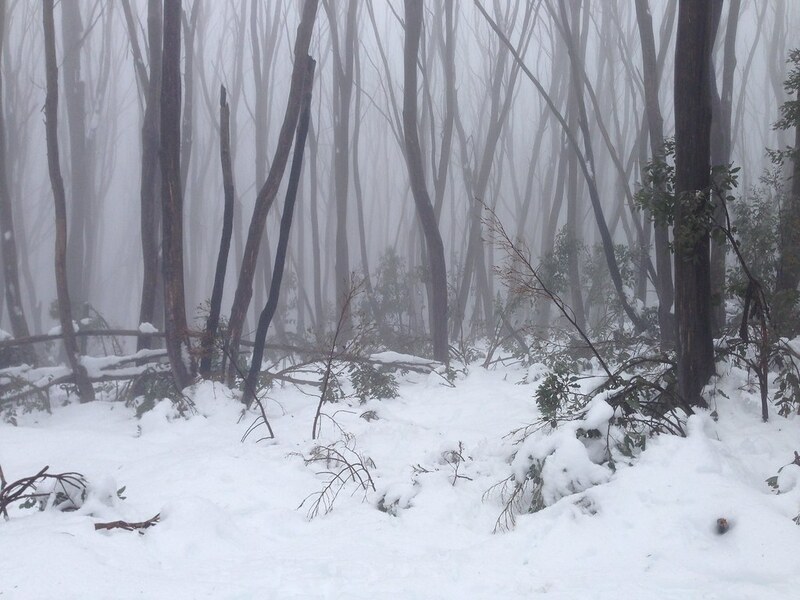 Thats pretty amazing for Lake Mountain. we've finally got a good base going now!